The retina is a thin membrane at the back of the eye that contains 120 million photosensitive cells called rods and cones. You can think about these like pixels in a digital camera. When light falls on one of these photosensitive cells it is detected and a signal is sent to the brain via the optic nerve. Processing all the information from our retina allows us to see. Light must be focused clearly on the retina and this requires a healthy cornea and a clear lens. Most of our clear vision that we use for fine detected in a central region of the retina called the macular. Poorly controlled sugar levels over a long period cause damage to the blood vessels that supply the retina located at the back of the eye. 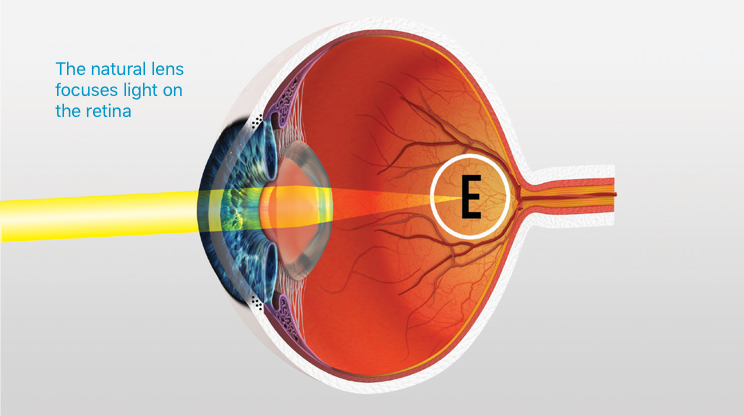 The retina detects light and allows you to see. If the fine blood vessels that supply the retina are damaged, they can leak or become blocked. In either case, this is called diabetic retinopathy, and can have serious consequences for your vision. There are two ways that diabetic retinopathy can threaten your sight: diabetic macular oedema (DMO) and proliferative diabetic retinopathy (PDR). Both DMO and PDR can be effectively treated if caught early, often before vision is obviously reduced. That is why diabetics must attend regular eye checks with their optometrist to monitor for the early signs of retinopathy. If you develop sight-threatening diabetes, you will be sent to an ophthalmologist at MCES. Most diabetics will develop some degree of retinopathy. If treatment is required, your best chance of keeping good vision is to start treatment early, before you notice symptoms. Damaged blood vessels can become leaky, allowing fluid to leak from the blood vessel. This fluid tends to collect at the very central part of the back of the eye — the macula. If this very important part of the retina swells, it loses its ability to detect light accurately and causes reduced vision. The retina at the centre of the eye is very thin (about a quarter of a millimetre), and if it swells — even by a small amount — then the ability to see can be reduced. Damaged blood vessels can become blocked, causing a lack of oxygen to the retina. The retina responds to this lack of blood and oxygen by stimulating the growth of new blood vessels. Unfortunately, these blood vessels are abnormal and fragile. They are prone to bleeding and can contract, pulling the retina towards the centre of the eye and causing total loss of vision from retinal detachment. 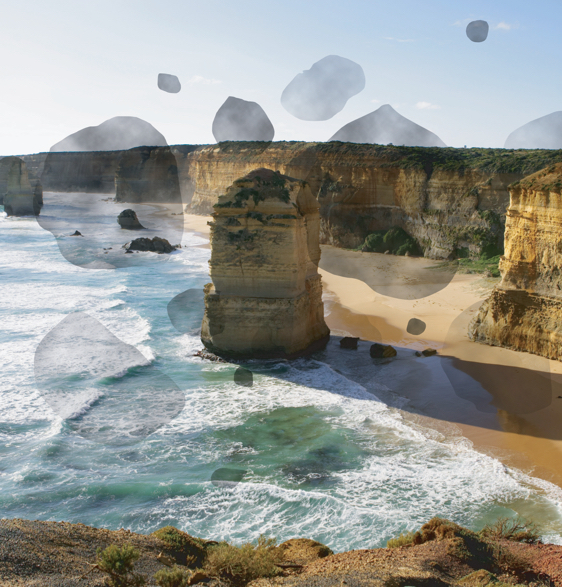 If your optometrist has determined that you have a sight-threatening complication from diabetic retinopathy, they can refer you to us at Melbourne Comprehensive Eye Surgeons. We will undertake a complete examination of your eye, which will include a high-tech laser scan or OCT, and possibly a retinal angiogram FFA, to assess the health of the blood vessels at the back of your eye. In most patients a course of six injections over 6–9 months is required initially, after which, injections may be required less often. However, many patients will require long-term treatment. If you have a developed DMO or PDR or a combination of both, you will require treatment to save your vision. In most cases, treatment is with a special medication that is delivered as an eye injection into the eye. In some cases you may be offered retinal laser for diabetic retinopathy. The most common treatment for diabetic retinopathy is now intravitreal injections. However, a small group of patients with either DMO (diabetic macular oedema) or PDR (proliferative diabetic retinopathy) or both may benefit from laser treatment instead of, or in conjunction with, intravitreal injections. Laser is used either to minimise the total number of injections needed, or to decrease the risk of recurrence of the sight-threatening diabetic retinopathy. In some cases, it is used to prevent the need for injections. There are two ways that laser can be used in diabetes: light or heavy laser. Laser is performed in a dedicated laser treatment room within the clinic. The pupil must be dilated for a clearer view of the back of the eye. Once the eye is dilated, the surface of the eye is numbed, allowing a contact lens to be placed on the surface of the eye. The contact lens holds the eye still and allows your surgeon to accurately focus the laser where it is needed for your treatment. Laser is a very high-energy beam of coherent light that is all of the same wavelength (colour). It can be very accurately focused on a tiny area of the retina — as small as one-twentieth of a millimetre in diameter. The light laser or focal laser is used to treat areas of swelling (DMO) or small, leaking blood vessels that are close to the centre of the eye, but not at the centre. 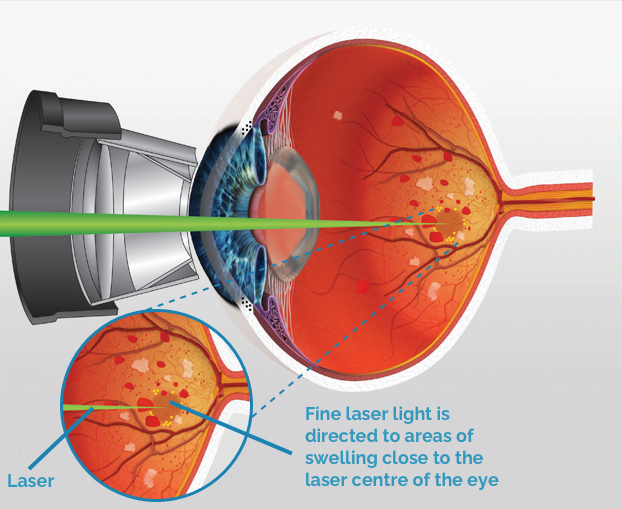 Areas of swelling more than half a millimetre from the centre of the eye can be safely treated with laser. 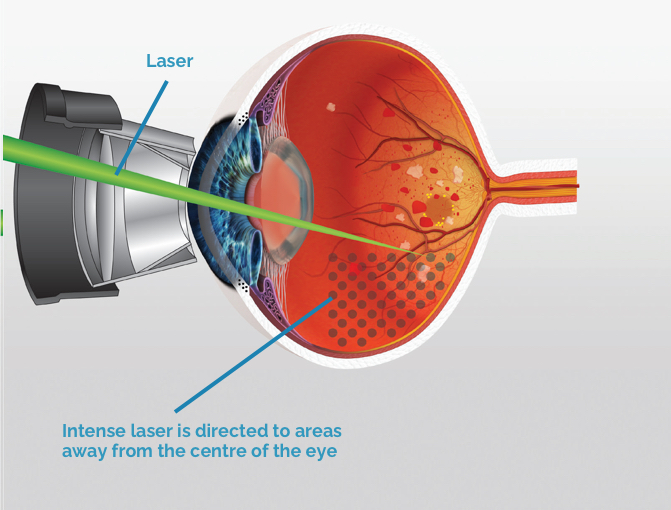 The laser stimulates the cleaner cells that live behind the retina. These cells have a natural pump function, and by stimulating this function, they clear the fluid from the retina and restore vision — or at least prevent further deterioration. The effect is long lasting, but multiple treatments may be required. Light laser is a painless and quick procedure. 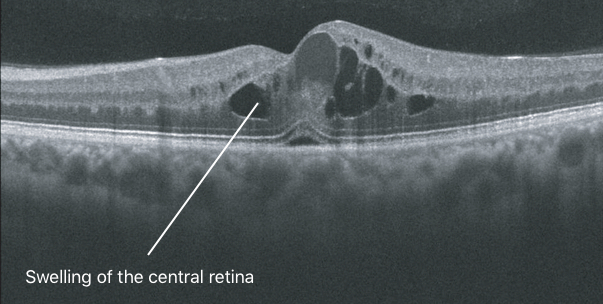 The heavy laser, or pan retinal photocoagulation, is used in cases of PDR. Heavy laser is performed over 3–4 sessions, can take time and is uncomfortable. The outer part of the retina is not receiving enough blood and oxygen due to blocked blood vessels from diabetes. It is this part of the retina that stimulates the growth of the abnormal, fragile blood vessels. Laser treatment destroys the peripheral retina and reduces the stimulation of new vessels. It is a destructive procedure, and is reserved for severe cases where, without treatment, severe vision loss is highly likely. Age-related macular degeneration (AMD) is very common. It is the leading cause of blindness in Australia. Ninety per cent of people with AMD have the dry form. It is slowly progressive and may lead to gradual loss of vision over many years. New treatments are emerging all the time. The macula is the specialised part of the retina at the centre of the back of the eye that gives us clear vision. The retina and macula sit on a membrane that protects it from the layer of blood vessels behind the eye. Over time, deposits in this membrane build up and form yellow plaques called drusen. 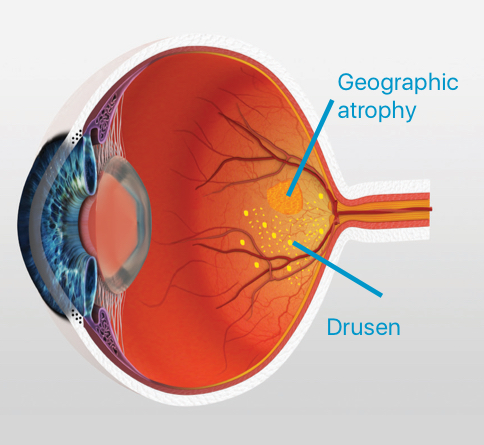 Drusen can be seen on clinical examination, but they generally don’t cause loss of vision. Unfortunately, drusen obstruct the ﬂow of nutrients from the vascular layer behind the retina to the cells in the retina. Over time this can lead to loss of vision (geographic atrophy). Micro-pulse laser is showing promise, but is still in research. About 10 per cent of patients with dry AMD will convert to wet AMD, the rapidly progressive form of AMD. Eye injections are an eﬀective treatment for wet AMD, but they must be started promptly or scar tissue will develop and limit long-term vision. 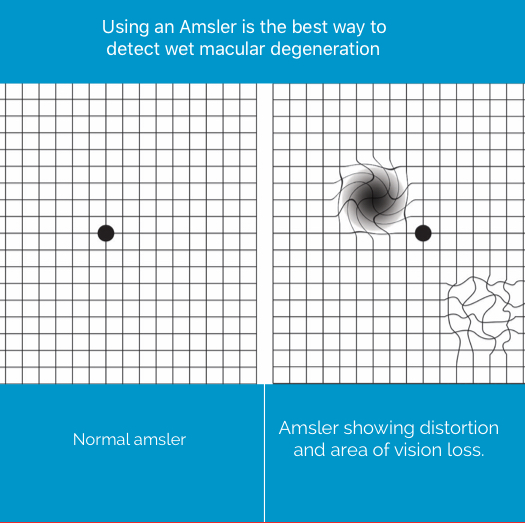 If you have dry AMD you should use your Amsler grid once a week to check each eye separately. If you notice a change, please contact us and make an urgent appointment. You can download the app ‘AMD eye’ at the App Store. If there is a change in the way the lines appear this could be an important sign that you have a bleed from wet AMD. If you notices irregular, dim, wavy, or fuzzy lines contact us to schedule an urgent eye exam. Hold chart at reading distance and read in good light. Cover your other eye to perform the test on both eye. Register for our contact list if you wish to be kept up to date on any new advances. A vein occlusion is a blockage in the blood vessels in retina at the back of the eye. It is more common in older people with cardiovascular risk factors such as high blood pressure, cholesterol, smoking or diabetes. A vein occlusion can occur in the main vein that takes blood out of the eye, known as a central retinal vein occlusion (CRVO), or a more peripheral branch, called a branch retinal vein occlusion (BRVO). The blockage damages the fragile blood vessels of the retina and impairs the ability of the retina to receive a healthy blood supply. 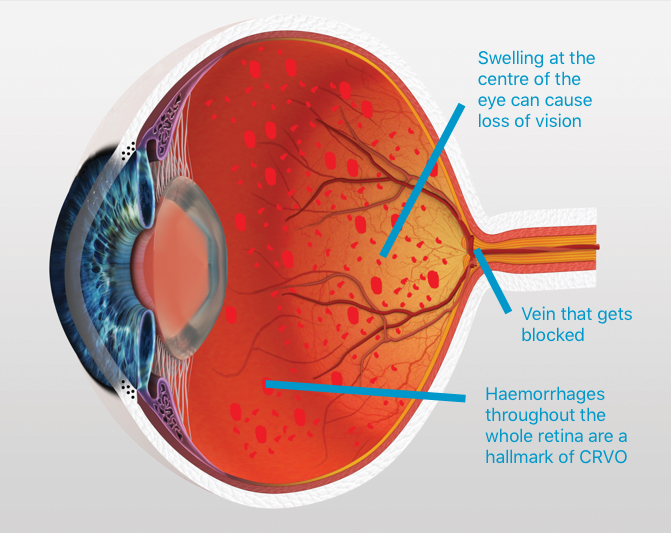 Damaged blood vessels bleed and can leak fluid into the retina, causing macular oedema. This is the main cause of vision loss from retinal vein occlusions. At MCES we have a state-of-the-art laser scanner called an OCT, which can detect minute amounts of swelling. In most cases, treatment should be commenced if fluid leakage from damaged blood vessels causes oedema that impairs or is likely to impair vision. Macular oedema can be successfully treated with injections of a medication called anti-VEGF. Initially, injections will be performed every month for three months. After this, a repeat laser scan will be used to assess your response to treatment. Injections may be continued at monthly intervals, or given less frequently. Most patients will need long-term treatment for three or more years. If you have reduced vision from macular oedema from: diabetic retinopathy, wet macular degeneration of a central retinal vein occlusion, your best chance of retaining good vision is to have eye injections from the time of diagnosis. If you have reduced vision from macular oedema from a branch vein occlusion, then it might be reasonable to watch for six months to see if vision improves by itself. However, if it affects your better eye, we would normally recommend treatment immediately. New vessels can grow in response to a lack of oxygen in the retina. The abnormal new vessels are prone to bleeding and may contract, pulling the retina away and causing blindness from a retinal detachment. Fortunately, with injections, new vessels are rare, but occasionally a laser treatment is required to control them. We have very competitive fees at MCES. If you need an eye injection you will need to see us for a retinal package. 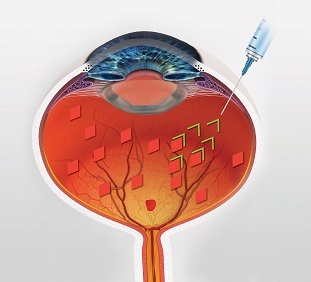 The cost of the injection is included in the retinal package. There is a cost for each review appointment but this generally accounts for only 1 in every 3 visits. Fundus fluorescein angiography (FFA) is a valuable diagnostic test that provides information about the blood vessels at the back of the eye (retina). It is a crucial test in evaluating and monitoring eye diseases that affect the retina. Your ophthalmologist may recommend an FFA if irregularities of the retina are suspected. The photographs can reveal if there are circulation problems, swelling, leakage or abnormal blood vessels in the back of the eye. A dye (fluorescein) is injected into a vein in your arm. The dye travels to the blood vessels inside the eye. A specialised camera takes a series of photos at timed intervals. 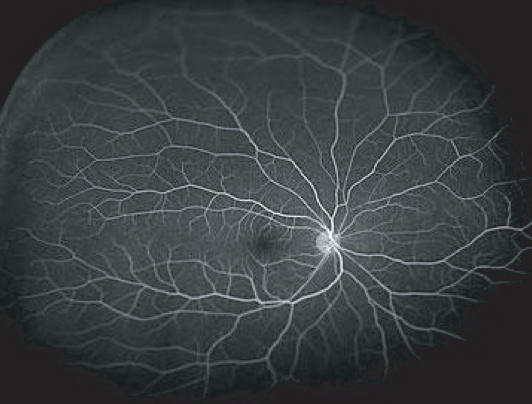 The photos show the dye circulating in the blood vessels in the retina. This highly specialised investigation is included in your retinal package with no extra out-of-pocket costs. This will help your ophthalmologist diagnose your condition and will help determine if any treatment is necessary. 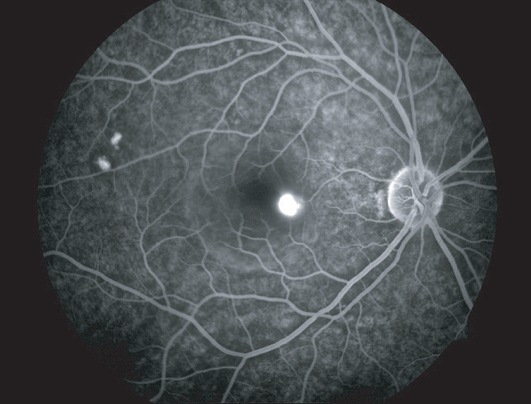 FFA is important for diagnosing and assessing conditions such as age-related macular degeneration (AMD), diabetic retinopathy and blocked retinal blood vessels. It can also be very valuable when the diagnosis is uncertain. We may need to repeat the test in certain eye diseases to monitor your treatment. Floaters are tiny clumps in the clear, jelly-like substance inside the eye called the vitreous. They can vary in size and are typically seen as dots, “hair-like” lines/squiggles, circles, cobwebs or clouds moving across your vision. They move when your eye moves, and are most visible when looking at a light background, such as a blue sky. At a young age, the vitreous jelly is reasonably solid and firmly attached to the retina. As we age, the jelly degenerates and becomes more watery. It can develop protein clumps and strands and start to pull away from the retina. 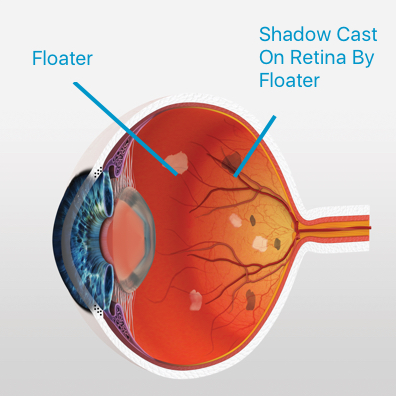 Once the vitreous pulls away, floaters can become more obvious as they cast more of a shadow on the retina. As the vitreous gel shrinks, it starts to pull away from the retina. This is a normal part of the ageing process. Very short-sighted individuals can develop floaters at a younger age. Severe trauma to the head can also cause floaters to develop at a younger age. Floaters can be associated with flashing lights, which look like flickering fluorescent lights. As the vitreous starts to pull on the retina, it can irritate the nerve cells, causing “flashing lights”. These lights are more obvious when you move your eyes — especially in dim lighting. A sudden onset of floaters and flashes can be a sign of a serious retinal tear. If a tear is detected early, it can be safely treated with laser, reducing the risk of developing into a sight-threatening retinal detachment. Most small floaters fade over time or become less obvious. Commonly, people find them most irritating when surrounded by a light background or reading. If large and irritating floaters persist beyond six months you may be a good candidate for laser vitreolysis a revolutionary new treatment avaialbe at MCES. The jelly can pull away in two ways, much like taking a price tag off a cardboard box. It normally pulls away smoothly; however, there is a risk it can pull off part of the retina with it, resulting in a retinal tear. Fluid can pass through the tear and under the retina, causing a retinal detachment. If a tear is picked up early, we can seal it with laser. This will essentially eliminate the risk of retinal detachment. If you have an onset of new floaters, flashing lights, fuzzy/blurry vision, and in particular, a field of vision defect, immediately arrange an eye appointment. What is an Eye Injection? Intravitreal injections allow highly specific medication to be injected where it is needed. Recent advances in the treatment of macular degeneration, diabetic retinopathy and vein occlusion allow patients with these conditions to maintain excellent vision. Treatment, may involve long term regular injections. At MCES we are aware that regular eye injections can be a significant burden. It is time consuming to attend appointments and the process of having an eye injection can be frightening and painful. For some patients, the cost can be prohibitive. We want to help keep your vision stable and healthy, without causing a financial burden or unnecessary discomfort. Floaters are visual disturbances that appear as cobweb-like or cloud-like shadows within your vision. They can be very frustrating. Floaters are condensations or opacities in the jelly that fill up the back of the eye. The jelly at the back of the eye is called vitreous, and lies between the lens and the retina. Laser floater removal is a non-invasive, pain-free procedure called vitreolysis. It is performed in our custom-designed laser room at MCES. The procedure takes only a few minutes per treatment session, and on average patients will require three treatment sessions. 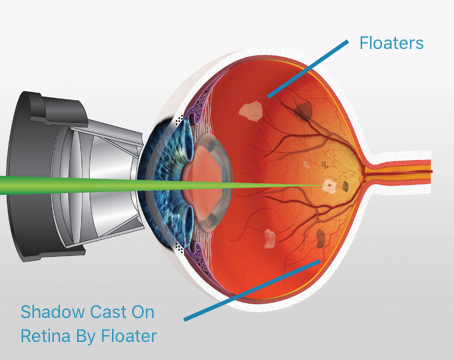 Our high-precision laser is mounted on a microscope, and we use a custom-built contact lens to focus the laser on your floaters. The laser energy disrupts the floaters, breaking them into smaller fragments. If we can break the floaters into small enough fragments, they will not cast a detectable shadow on the retina, and you will no longer see them. If you are older than 45 and suffer from larger shadows or cobwebs in your vision that have been persistent for more than six months, you are a good candidate for vitreolysis. Almost all people will experience floaters at some point. For most, it is a minor and short-lived inconvenience, but for some it can become a nuisance that affects their life. Until now, most ophthalmologists have simply advised people to ignore floaters. Or, if very debilitating, doctors have suggested patients undergo a major and potentially risky operation to remove the jelly and the floaters from the back of the eye. 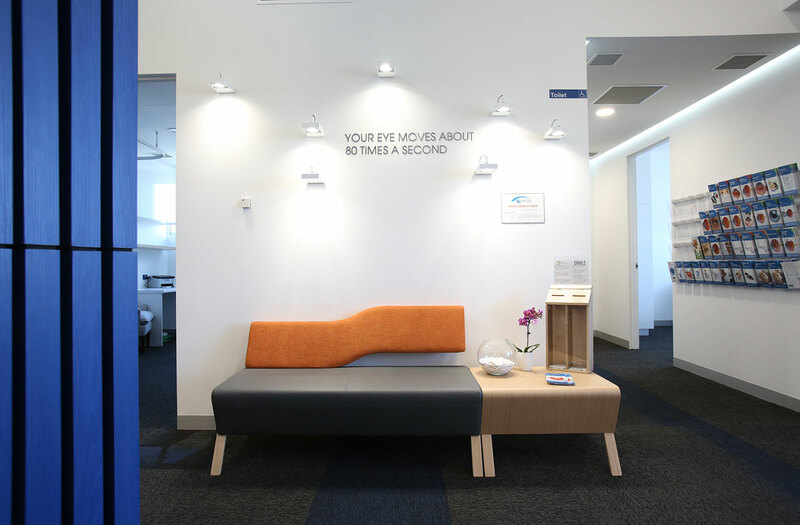 If you would like to discuss the possibility of laser vitreolysis, visit us at Melbourne Comprehensive Eye Surgeons, where you will undergo a complete eye examination to determine if laser might help with your floaters. Why is the retina so important? Think of the retina like pixels in a digital camera. Each point on the retina contains photosensitive cells that can detect light and send signals via the optic nerve to the brain, where the information is processed. The retina is a very fragile tissue and if damaged vision may become blurry or be lost. How do a check my retina for damage? You can use a special chart called an Amsler Grid to help identify the early signs of some disease such as macular degeneration and diabetes. We suggest you see us at Melbourne Comprehensive Eye Surgeons to see if this is something you should do and to be shown how to correctly use your Amsler Grid. What are floaters and are they harmful? Floaters are impurities within the jelly that sits inside our eyes. They float around like specks or smudges and cast a shadow on your retina that can interfere with your vision. They are more common in short sighted people and those who have had a vitreous detachment. Floaters can be harmless but may be a sign of more serious retinal damage and if you notice new floaters particularly if associated with flashing lights you should get a prompt eye examination. 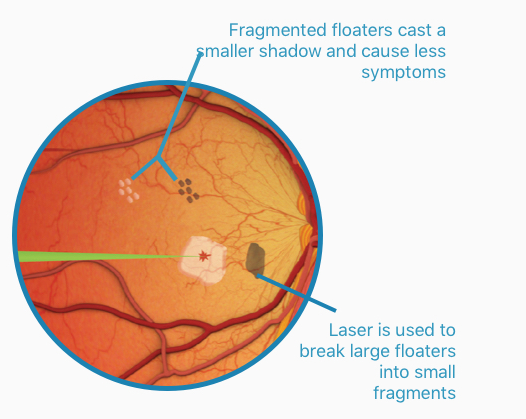 If your floaters are bothering you, laser vitreolysis may be an option to minimise their impact on you vision. Macular degeneration is a disease affecting the central part of the eye that is responsible for providing clear vision. 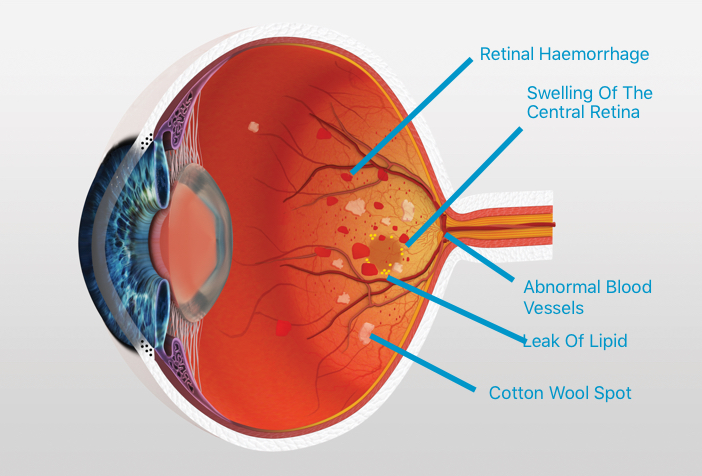 The tissue that supports the retina can become damaged and weakened with age, this can cause areas of the overlying retina to die (dry Macular Degeneration). Sometimes areas of weakness can allow an aberrant blood vessel to grow into the retina causing a bleed (wet Macular Degeneration). Dry Macular Degeneration generally causes gradual loss of vision over many years. there is no definitive treatment for dry Macular Degeneration although much research is occurring in this area. Wet Macular degeneration causes rapid distortion and blurring of central vision. 90% of vision can be restored by seeing your ophthalmologist quickly and having injections of a new medication into your eye. At Melbourne Comprehensive Eye Surgeons, we offer bulk billed eye injections in our public access clinics held on a Wednesday morning. 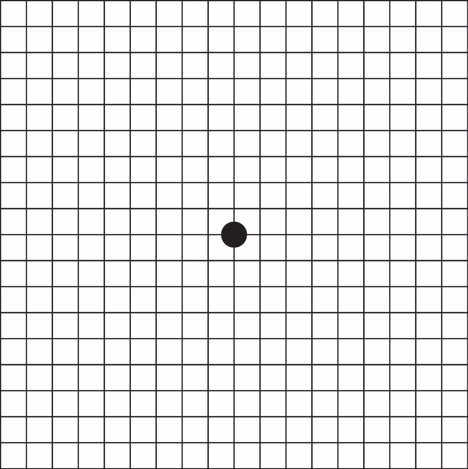 Symptoms of macular degeneration are best detected by using an Amsler Grid. How will my doctor diagnose macular degeneration? Undergo a preliminary eye examination with our highly trained high technician. Have several eye investigations performed using our state-of-the-art Ziess diagnostic equipment. Including high resolution retinal photographs and an OCT or laser scan of the macular. You may also have retinal angiography performed, all of these investigations are included free of charge in the retinal package. If you require an eye injection this is included free with the retina package. How much does an eye injections cost? At Melbourne Comprehensive Eye Surgeons, MCES, eye injections are free (bulk billed) in our public access clinics that occur every second Wednesday morning. If you cannot make these clinics injections can be undertaken any time for a small cost- contact the clinic for details. Diabetic retinopathy occurs when the fine blood vessels that supply the retina are damaged by high sugar levels in the blood. Damaged vessels can leak or become blocked. In either case, this is called diabetic retinopathy, and can have serious consequences for your vision. Diabetic retinopathy is often relatively asymptomatic until late in the disease process. For this reason, it is important for all people with diabetes to get checked by their local optometrist every year. If you notice blurring or distortion of your central vision you should have an urgent eye check with your local optometrist. What is a Diabetic Eye Screening Clinic? 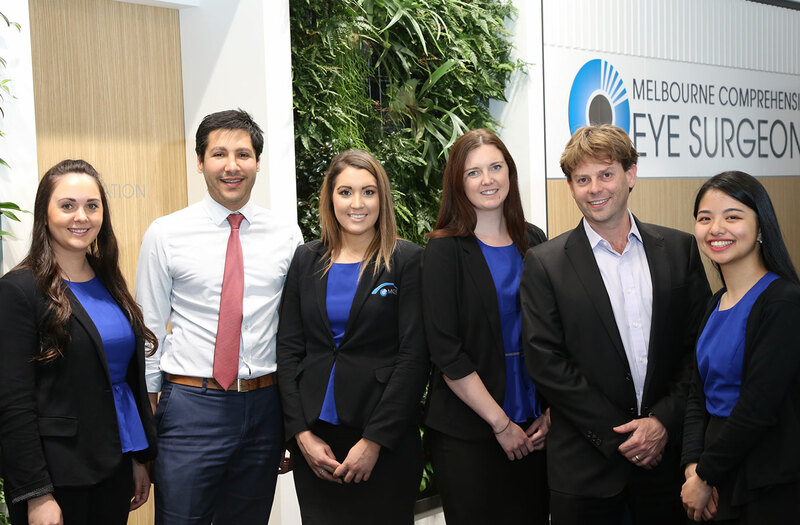 Melbourne Comprehensive Eye Surgeons, MCES, runs a free diabetic eye screening clinic. Clinics occur every 3 months and require a referral from your GP. They are not available if you already have a diagnosis of diabetic retinopathy or are undergoing regular review with your optometrist. How will my doctor diagnose Diabetic Retinopathy? A vein occlusion is a blockage in the blood vessels in retina at the back of the eye. It is more common in older people with cardiovascular risk factors such as high blood pressure, cholesterol, smoking or diabetes. The blockage damages the fragile blood vessels of the retina and impairs the ability of the retina to receive a healthy blood supply. Damaged blood vessels bleed and can leak fluid into the retina, causing macular oedema. This is the main cause of vision loss from retinal vein occlusions. Retinal vein occlusions will normally cause blurring of central vision. If you notice a change in your central vision you should see your optometrist urgently. They will be able to detect if you have a vein occlusion and can refer you to an ophthalmologist (eye surgeon) like one of our ophthalmologists at Melbourne Comprehensive Eye Surgeons, MCES. How will my doctor diagnose retinal vein occlusion?